EU Referendum – are you in or out? This topic has 66,047 replies, 841 voices, and was last updated 9 hours ago by mikewsmith. Tagesschau24 have just flashed up .2% growth and -.5% industrial production with a picture of a broken union flag and suitably negative commentary. Whilst German growth for the same quarter was 0.1% and industrial production fell 0.4%, which is the fourth month in a row of decline. You are one and half thousand pages late for the start of the debate on here (and you need to go back to the 70s if we’re talking about debating what Corbyn and his immediate team are up to now). It shows the same as far as I can see. The UK going from out performing to under performing – and it still hasn’t hapened yet. 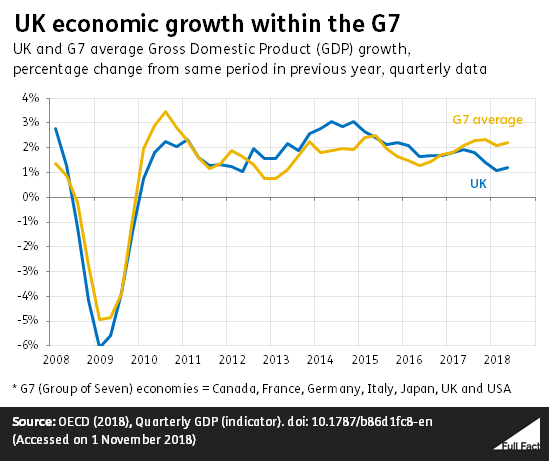 G7 figures include US which is showing far stronger growth than Europe at the moment, also include Japan which is more of a mixed bag. are there any actual indicators that the UK growth will increase? Or the quantification of the early results from this year? Certainly I’ve seen quite a few people pushing for orders to be delivered before March and an increase in stock being taken on which could look like growth and then fall flat next FY. And more and more the question what will this cost us in April? Never good to have to say we have no idea. I wonder what might have happened in the year since the data in those graphs… and what about the year upcoming? Anything about to happen that might put us even further behind? Please can I have my ball back, you don’t want to play nor include me and I feel justified by asking for my ball back. UK growth has been slightly better than the Eurozone, UK has matched forecasts, Eurozone has under performed forecasts. Interesting that Mefty should now insist on comparing the UK (world’s fifith biggest economy) with the Eurozone basket, which contains some weak economies, rather than its G7 peers. How long before you are comparing the UK with Greece to try and flatter the UK figures, Mefty? Matched lower forecasts yes, but the fact that the Eurozone under performed suggests that there are other factors leading to reduced growth. 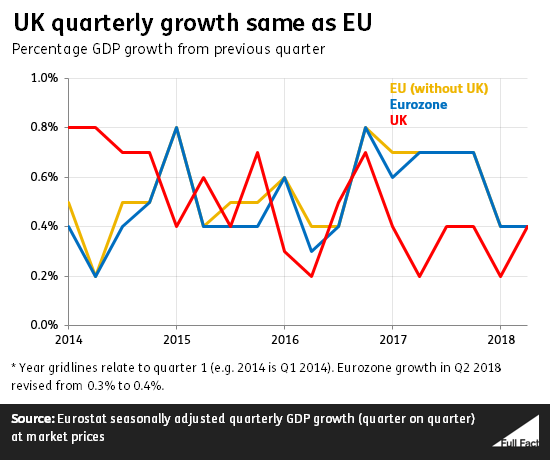 The major economies in the Eurozone dominant the Eurozone figures, if anything the Eurozone figures flatter the major economies as the smaller economies did well in 2018 on the whole. But in the context of a debate about membership of the EU, a comparison to those economies seems most apposite. Germany’s growth was 1.5% slightly ahead of the UK for the whole year, but Germany slowed quite rapidly towards the end of the year, hence the low forecast for 2019. France was a bit behind at 0.9%. Germany’s growth was 1.5% slightly ahead of the UK for the whole year, but Germany slowed quite rapidly towards the end of the year, hence the low forecast for 2019. That sounds a bit like the way my VW trip computer “forecasts” range remaining. and taking on the rest of the world if Williamson has any say in the matter. He seems to be harking back to the days of gunboat diplomacy. Williamson’s speech reads like the pompous rantings of a 1950s Tory on the make. It cannot conceivably have been cleared with colleagues, let alone the Treasury. It is best forgotten. What on earth is Williamson talking about – apart from a desire to be Tory leader? I love all these clips of footage being described as “unearthed” like they’re well hidden. My guess is that there’s one a week for the whole of the transition period. Same as the arch remainer PM we have, at this point even digging up old clips of JC is pointless to the debate. I know some will be off to have a little shuffle over it but what’s the actual point. He can’t whip his MP’s to do things they don’t want to do, just as May can’t whip her’s. Neither of them can deliver anything and their chosen path is impossible. Slightly off-topic but note that even though (another dimwit) Amber Rudd has acknowledged (admitted) that the rollout of Universal Credit has directly led to an increase in people going to food banks, SHE STILL DIDNT ACTUALLY APOLOGISE! I strongly suspect the reason for this is that she knows that a lot of Tory support is actually cheering this. We’ve got to get rid of these buggers once and for all. He’s up against some pretty stiff competition. Aircraft carrier against relatively modern military with cruise missiles, Exocet type air to ship and decent subs? No, ta very much. On the bottom within an hour. A 20 per cent drop in the value of the pound might not be “such a bad thing”, David Davis has claimed as he called for a tax-cutting no-deal budget. Let me check on our Iron ore reserves, or aluminium, or heaps of the other stuff we import in order to try and generate some GDP…. Well with Grayling’s latest brilliant effort, Davis has to try something to get back above him in the “thicko” charts. This was on twitter earlier and gave me a laugh. Laughs are needed as we hurtle towards the cliff with the controllers arguing about what what speed we should aim to go over the top. Your favourite government department (yes, him again) is apparently being sued for conducting the procurement process for the ferry contract shenanigans in secret. And we know how well that went. Eurotunnel claim they weren’t given the chance to bid for contracts (or I assume parts of contracts seeing as it was split 3 ways in the end); Fayling says it was because he knew they didn’t have the capacity and it was for maritime carriers only. Q1 Wouldn’t you speak to the largest freight carrier in this area and see what they can do to flex their capacity – maybe they couldn’t do it all but every bit would be useful. Q2 How much capacity is provided by no ships? I said at the time it was weasel words – along the lies of ‘we’ve conducted due diligence and there’s nothing that would preclude Seaborne from participating in a contract with the government’. (So could I, I don’t have a criminal record / been disbarred from running a company, etc. I can’t run freight for them though….) Now I wonder if the procurement process was even fishier. These are just rollover deals too, I thought the point was we’d negotiate amazeballs new trade deals that’d wee all over what we’d done before….? The promise of amazing trade deals . . . .
It’s like we’ve gone to conquer a foreign land somewhere and, to our surprise, found that they are all carrying machine guns when we thought they would be carrying spears. How will we drive our goods to Switzerland? Isn’t it surrounded by EU countries? Looks like T-Maybot is set to step down in the summer.